On Sunday, Apr. 8, two of the three executive slates running for the 2018-2019 ASSU presidency and vice presidency participated in a debate co-hosted by The Stanford Daily and KZSU. 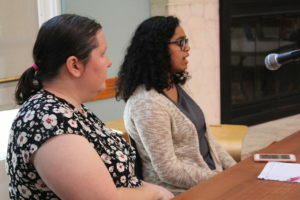 Shanta Katipamula ’19 and Ph.D. candidate Rosie Nelson (the Shanta-Rosie slate) debated Khaled Aounallah ’19 and Michael Ocon ’20 (the Khaled-Ocon slate) for approximately an hour while KZSU’s Caleb Smith ’17 M.A. ’18 and The Daily’s Yasmin Samrai ’21 moderated. Shanta Katipamula ’19 and graduate student Rosie Nelson are running together on a slate for ASSU Executive (APARNA VERMA/The Stanford Daily). A third “joke slate” — dubbed Associated Students of Stanford and made up of John McNelly ’19 and Cale Lester ’19 — was invited but did not attend. Samrai and Smith opened the debate with a call for civility and a plan for the flow of debate, as well as a note on what role the event was meant to play in the larger ASSU electoral process. “We want to know why Stanford students should vote for them, what initiatives they want… and whether they can feasibly effect change on campus,” Samrai said. The members of the two slates then introduced themselves. Aounallah and Ocon both noted their involvement with the 18th Undergraduate Senate (as a senator and an intern, respectively), while Katipamula said she chaired the Senate that year and Nelson said she is the current Graduate Student Council (GSC) co-chair. The debate began with a question about what each slates’ top priority is, given that they would likely need to make compromises if elected. Katipamula identified her slate’s experience as a key factor, allowing them to understand what projects are feasible and what the University would be willing to work on with them. 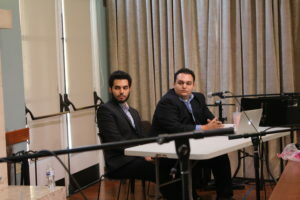 Khaled Aounallah and Michael Ocon are also in the running for ASSU Executive (APARNA VERMA/The Stanford Daily). Aounallah, meanwhile, emphasized more external methods of promoting change. Nelson, however, rebutted that campus activism can take many forms, including not just protest but also “trying to intersect yourself into administrative situations” and working for change from within. In response, Aounallah clarified that the activist community includes institutional work and leadership, and that he and Ocon are not “against the establishment” but rather want to leverage outsider voices when pushing for institutional change. The next question expanded that dialogue to ask how each slate would address the process of working with University administrators. Ocon pointed to his work on the issue of workers’ rights under Residential and Dining Enterprises (R&DE) as evidence of the importance of coalition-building and communication, while Aounallah noted the pair’s work on other issues with University leaders like Vice Provost for Student Affairs Susie Brubaker-Cole. Nelson similarly pointed to her prior work with Vice Provost for Graduate Education Patricia Gumport and the Stanford Solidarity Network in advocating against a graduate student tuition waiver tax suggested in an early version of the 2017 Republican tax bill. “As chair last year… I worked very closely with [Vice Provost] Greg Boardman to get an open office hours initiative between the ASSU and administration [passed],” Katipamula added. She also discussed her work implementing the pilot program of the Callisto sexual assault reporting platform. Another question from the moderators raised the question of sexual violence on campus, an issue addressed by each slate’s platform. Although both pairs of candidates emphasized the importance of victim-centered reform and have experience working on these issues, they differed on one specific policy area: whether undergraduate representatives should sit on Title IX panels. Following a policy change several years ago, the panels currently only include graduate students, faculty and staff. The Khaled-Ocon slate supports adding an undergraduate panel member; the Shanta-Rosie one does not. “One thing we’ve been hearing a lot is about the lack of accountability to undergraduate students in terms of how the [Title IX] process is working,” Ocon said in response to a listener question later in the debate. Katipamula responded that the current lack of undergraduate representation was a change made under former president Elizabeth Woodson ’15 (2014-2015 ASSU Executive). “The reason Elizabeth Woodson advocated for [the panel] to no longer have an undergraduate student… is because they wanted to be able to invest a lot of money in really, really intensive training that would require a panelist to then serve two to three years,” Katipamula said, adding that it would be harder to do with undergraduates. When asked about their biggest accomplishments and biggest struggles in campus politics over the past year, Ocon said that many of his efforts with Stanford Sanctuary Now to make Stanford a sanctuary campus were not supported by University administrators. However, he noted that other immigration-facing efforts done with Provost Persis Drell, such as sensitivity training in dorms, were more successful. Nelson, in turn, identified her work as GSC co-chair in completing and analyzing the results of the graduate student survey as a major success, and Katipamula pointed to the University’s treatment of Brock Turner sexual assault victim Emily Doe as a recent struggle. On the topic of mental health, Katipamula said an important goal of her platform includes ensuring Counseling and Psychological Services (CAPS) counselors are more attune to the challenges faced by first generation and low-income (FLI) students. “We really need to have people who understand the needs of our communities on campus,” she said, expressing her admiration for Georgetown University’s mental health support for FLI students. Nelson added that graduate students face their own unique issues, including often getting referred to off-campus mental health resources and not always receiving support from faculty. Ocon — who is on the student advisory committee for CAPS — emphasized accessibility issues, especially with regards to the affordability of counseling sessions beyond the six to eight sessions that are provided for free. The slates also discussed their approaches to topics like student group funding in terms of student fee waivers and divestment at both the ASSU and University levels. The moderators then moved into the second phase of the debate, which involved slate-specific questions. First, the Shanta-Rosie slate was asked about the value of collaboration between undergraduate and graduate students, which has been a focus of their campaign. Aounallah and Ocon responded by noting their own connections to graduate students by way of various student groups, and Aounallah added that he will be coterming next year. The moderators then asked the Khaled-Ocon slate about why students who didn’t vote for them in last year’s election — when the pair ran together for the first time, coming in second — should change their vote and do so now. “We ran last year largely in an effort to raise awareness about issues that we felt were not being talked about,” Ocon said; in particular, he noted, the Stanford Sanctuary Now movement. Aounallah added that last year’s campaign gave them momentum, leverage and know-how going into this year’s. Moving into the third segment of the debate, each slate had the opportunity to ask their competition a question. Shanta-Rosie asked Khaled-Ocon what they thought the most important issues facing graduate students are. Accessibility and affordability, Aounallah responded. “In my experience… it’s very hard to be a student at Stanford, especially if you live off-campus, and I think one of the biggest challenges across graduate communities is the lack of housing, for example,” he elaborated. Then, for their question, Khaled-Ocon asked Shanta-Rosie how they would address questions about free speech and visiting lecturers on campus. After a brief public question-and-answer session that revisited some earlier topics – namely, the Title IX process and slate priorities – both slates gave brief closing statements that emphasized the importance of both effective ASSU leadership and wider political engagement. The final words were left to Smith. Brian Contreras '20 is the Desk Editor for Student Groups. A sophomore studying STS and Anthropology, he hails from Washington, DC and hopes to pursue a career in tech or policy journalism. He is also interested in satire, backpacking, sci-fi, running, and using Oxford commas (no matter what AP Style says). Contact him at brianc42 'at' stanford.edu.